CLEAR FORK VALLEY – If you’re thinking you’d like to get out of the fall weather, and go someplace warm, you might like to check out the scene at Clear Fork High School. 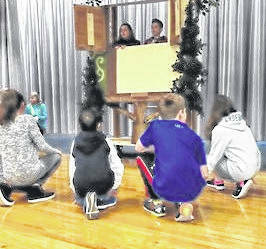 Middle school kids are ready to transport you to an island, the scene in a play which will be presented to the public Nov. 19. The play is “Pirates past noon,” from the tree house collection of stories. The crew of 50 kids is rehearsing songs, dance and lines at the auditorium in the school. 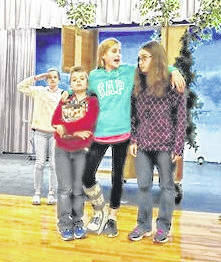 The play will be shown to school kids first, then to the public Nov. 19 at 7 p.m. Tickets for the event are $5. Jaya Shultz plays the slightly questionable Capt. Bones, who is using all her energy to curb impulses of Ann and Jack. Ann and Jack are the two who dream about going someplace else, and they end up on the island. Capt. Bones wants them held captive. Kaitlyn Schneider, 13, plays Ann. Christian Walker, 11, is Jack. Shultz is 13. Shultz, who is rehearsing with her right leg in a boot, wants people to know the plot is not all about evil people. Ann and Jack help some people on the island learn to read. The two who wanted to escape wanted an island with a sunny beach, and a ”big fat rock,” they said. At a recent rehearsal, most of the props were there, except for the “big fat rock.” That will be added later. Shultz, Walker and Schneider said they had to do auditions, where they were judged on their singing, dancing and acting. Walker said he thinks he got selected partially because of his speaking skills. He has done speech competitions, as has Schneider. “I’ve done really good there,” said Schneider. Schneider is doing her rehearsal duties with a stuffy nose. She said she just woke up one morning, with that problem. As for Shultz, her leg problem is one on which she did double duty. She said she sprained her ankle when doing a flip a month ago. Then she sprained it again playing basketball. Things are improving, she said. She thinks she won’t have to wear the boot when performances occur. After it is removed, she will probably have to do stretching exercises, she said. The play, which is 40 minutes long, is being directed by James Michalovich, who teaches eight grade social studies.